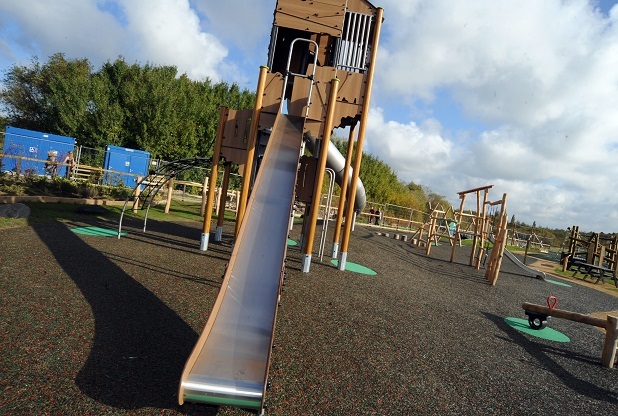 The children's play area is located close to the Spring Lane car park and has a separate toddler's section with a sand pit and a wheel chair accessible roundabout. The main section for older children has a large 'rustic mining tower' and many other exciting swings and climbing frames. 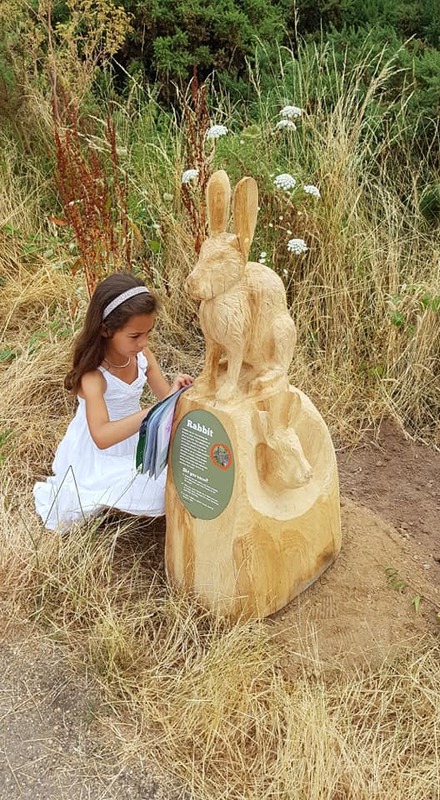 The trail features eight 3ft wooden sculptures of the wildlife found across the country park – a heron, badger, hedgehog, fox, rabbit, mole, pipistrelle bat and a green woodpecker. Each carving has information signs with facts about each animal, set at wheelchair-friendly height, and interactive ‘rubbing plaques’ where children, using crayons, can create animal impressions in their booklets. The trail follows the ‘High Hazels’ accessible footpath, a 1.4km wheelchair and pushchair-friendly circular route. Wheeled stuff – Scooters, trikes, family biking ... all of the main paths around the park are nearly pavement quality, albeit hilly in spots. There’s a reasonably long stretch of flat path near the Spring Lane entrance. Kite flying – The park is one of the highest points in Nottinghamshire and it’s pretty windy up here. Pocket kites are available at some supermarkets and from Amazon for around a fiver. Duck feeding – Take some bags of seed with you and feed the ducks, which can be found on the two lagoons near the Arnold Lane (old tip) entrance. Nature spotting – From looking for signs of Spring, to mini beast spotting, to identifying the different types of birds, butterflies, wild flowers and trees in the park. We have guidance on what plants and animals to look out for on our Recording Wildlife page and there is also a check list you can download on our Wildlife Check List page. There are loads of other free resources here: http://www.rspb.org.uk/discoverandenjoynature/families/ and on the web. The park contains a selection of countryside walks of differing lengths and abilities, which either go through woodlands or across open grasslands with fantastic views of Gedling and Carlton and across the Trent Valley towards Lincolnshire. All routes are circular and are signposted at every junction. These four trails are named after the coal seams that existed underground at the site of Gedling Colliery. For more information, please see our Heritage web page. There is a map available of these routes on our Park Map page. Considerate cyclists are welcome to use any of the footpaths and there is a great collection of challenging slopes throughout the park. Please be aware of the open drainage channels that run across the steepest footpaths. We also ask that cyclists stay out of the fenced off areas that are there to protect the ground nesting birds. A butterfly walk has been created running parallel to Spring Lane, between the car park and the pedestrian entrance towards Lambley. Please see our Butterfly Walk page for more information. Our Memorial Garden has been built to remember all of the people who lost their lives working at the former Gedling Colliery - on which Gedling Country Park now resides. The garden is located next to the central lagoon at about the halfway point of the High Hazles accessible path. Please see our Memorial Garden page for more information. Disabled users are advised to enter the park via the main car park entrance on Spring Lane. There is a relatively flat pathway suitable for wheelchairs that runs from the main car park past the children's play area and down to the central pond and picnic area. Please be advised that other areas and paths in the country park can be steep in places. There is a 'Changing Places' changing room and disabled toilets available in the Visitor Centre located close to the Spring Lane car park. ﻿All toilets are located close to the Spring Lane car park in the Visitor Centre.